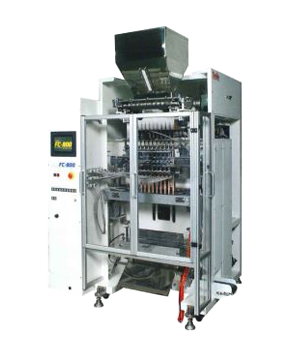 Vertical Stick Packaging Machine | T.H.E.M. The FC 800’s simple settings and changes through a touch panel allow for package length and mark control. Customer requirements are met and exceeded with the wide ranging benefits of the FC 800. Simply pressing the touch panel can alter the setting and change the bag length. It is simple and easy. Various packaging data can be stored in the memory including charging timing, the position of pattern matching and defective products discharging timing. The operation of the box motion can be set to the optimum conditions for the materials to be charged. The servo-motor drives the up-and-down movement of the horizontal sealing device, and the material data can be stored and registered in the memory. 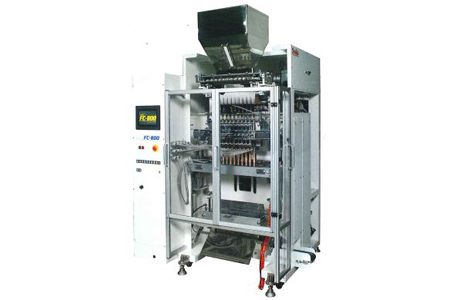 An auger filler, quantity measuring device and mass measuring device can be connected to this stick packaging machine. The use of the dial can change the cut position of the products with ease.